Once you’ve decided on what you’d like to do contact trailmaze on admin@trailmaze.com to setup your tour. The prices below are per person for a full day adventure and include travel to the location and equipment hire such as mountain bikes or kayaks. Getting to Deep Pass canyon requires a 40-50min 4WD trip. Once there Deep Pass is one of the most amazing bushwalks in the area. You’ll venture through a spectacular canyon using ropes to get through certain sections. This is a bushwalk for the more adventurous and requires a certain level of fitness and agility. There are water holes if your keen to go for a swim. After being blown away by the canyon we’ll finish the day by checking out the Glow Worm tunnel. 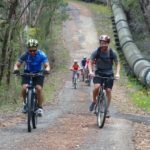 Tour 2 – Narrow Neck Mountain Bike Ride. 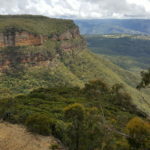 Narrow Neck is a 20km mountain bike ride in the Blue Mountains. This ride offers incredible views along the way. 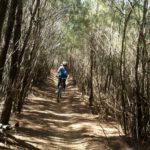 The mountain bike trail isn’t all that technical and would suit all levels of riders. There are some large hills you need to peddle up and be wary of coming down. At the end of the Narrow Neck trail we’ll go for a short bushwalk down Tarros Ladders. How far we go will depend on how adventurous you are. That will make more sense once your there. 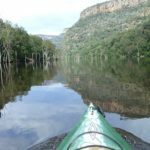 If you enjoy kayaking you’re going to love this paddle in the Kangaroo Valley. 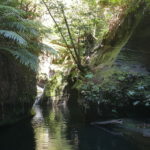 We’ll paddle down Shoalhaven River and checkout the amazing gorges in this area. The reflection of the gorges off the mirror like water makes for the perfect photo opportunity. How far up Shoalhaven River we go will depend on your level of fitness. Though we don’t need to go that far before we enter the gorge. Trailmaze is happy to take you on any mini adventure on the trailmaze website. If there are any you’d like to do just contact us on admin@trailmaze.com to organise what activity you’d like to go on.